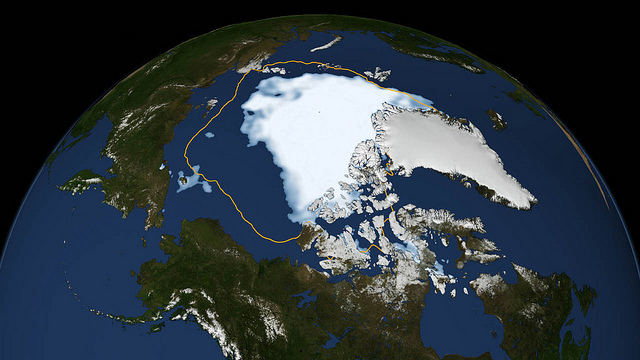 “This visualization shows the extent of Arctic sea ice on Aug. 26, 2012, the day the sea ice dipped to its smallest extent ever recorded in more than three decades of satellite measurements, according to scientists from NASA and the National Snow and Ice Data Center.” Read More. Photo: NASA Goddard Photo and Video/Flickr. Guy, may I repost this to http://theredmullet.blogspot.com/ ? Appreciate your work and your not sugar coating the facts. So many so called activists want to create happy endings that do not exist. These feedback loops is what we need to pay attention to to. I hear many say its been a cool august or we had allot of snow last winter. Ice in Arctic is melting slower than last year. Your 19 points will refute all the denier’s clams as when there is more moisture in the atmosphere and the slowed and increasinging negative tilted jet stream confugures itself just right you can get cool upper air low pressure systems that will support cooler and snowier weather. The slowing and the often negative tilt to these dips I find most disturbing . This is a result of the lessening of the temperature differential between equator and poles. Despite this brief localized cooling trend it is very clear that the overall temperature trend is up. This is most apparent with overnight low temperatures. These temperatures especially in the northern latitudes have risen the most dramatically. Going to make a video one day trying to break down this, thanks. OH NO! I don’t like the feedbacks. I’ll ignore them & they will go away. How can anyone possibly ignore this?? Thanks, Guy, again. TR, this is not stricktly true, the whole of nature beats to a very rythmic beat called the yearly cycle. Everything watches for the rise in spring temperature and the return of sunlight. If they change or fail whole behaviour patterns fail or shift. They may not measure it with a clock – but they measure it just as surely as any man does. If the anual cycles fail then nature fails with it. What is the 20th feedback loop that Guy needs to be informed about?! Ok to publish your material in our blog? How about the following as a feedback loop, since Fukushima contaminated the Pacific? Remind me never invite you to a party; but then again, I don’t feel much like partying these days. I remember hearing a man on the radio a while back, maybe it was On Point Radio or the University of Hartford station, who was the only one by the way, who basically said “game over”. I bet that was you. I thought to myself “that’s my dirty little secret I’m afraid to say to anyone” and someone else is saying it in public. I’ve taken to coming up with bumper sticker slogans while I drive. Here are a few. Is any one worth putting on my bumper?